From Masterton, with our noses pointing north, we travelled up through Eketahuna, Pahiatua, Mangatainoka and Woodville, to Dannevirke. With time constraints, exploring all the small towns is just not possible, unfortunately. Another trip, we tell ourselves. We had phoned ahead to book our campsites in Dannevirke Camp Ground (#3961 NZMCA) for the night. This little camp ground is worth supporting as fees are very reasonable and the facilities good. A powered site costs $22 for 2 people per night with NZMCA discount. It is administered by the Tararua District Council. I had long wanted to visit Ormondville, and figured this was my chance, so I discussed it with our travelling companions. If they weren’t keen, then we would go, and catch them up later. As it turned out, they’d never heard of it and were very keen when I told them about what I’d read. So the next day we set off, with Ormondville the next stop. Twenty or so kilometres north of Dannevirke we see the sign post for Ormondville and from there it’s only six kilometres off SH2. This area includes the small town of Norsewood, and as the name suggests, has a strong Scandinavian history with the Government of the 1870s encouraging immigrants from Scandinavia to come to New Zealand and farm the land. It thrived for a time but when the railway came through, it bypassed Norsewood and stopped in Ormondville instead, resulting in a decline in the fortunes of Norsewood. And there’s my reason for wanting to visit this quaint little place – the oldest complete rural rail precinct remaining in New Zealand, the Ormondville Railway Station, now a Category 2 listed Historic Places Trust building. Built in 1880, with its heyday in the 1950s, it served the district well. The first 30 years saw several additions and alterations take place, and then it remained unchanged for years. In the 1980s the Ormondville Rail Preservation Group was formed and leased first the goods shed, and then the station six years later in 1993. The last passenger train (the Bay Express) stopped operating in October 2001, and now just the odd goods train rumbles through. It’s well worth the short drive off SH2 through beautiful countryside to take a look at Ormondville for yourself. Next trip we’ll take a closer look at Norsewood. I love exploring these small rural towns. Half an hour further on SH2 brought us to Waipukurau and the Hatuma Cafe, which had been recommended to us by a local, and we were ready for lunch. It looks like pies were the order of the day. Continuing on our way with our destination being Napier, we pass through Waipawa and before long we are there. 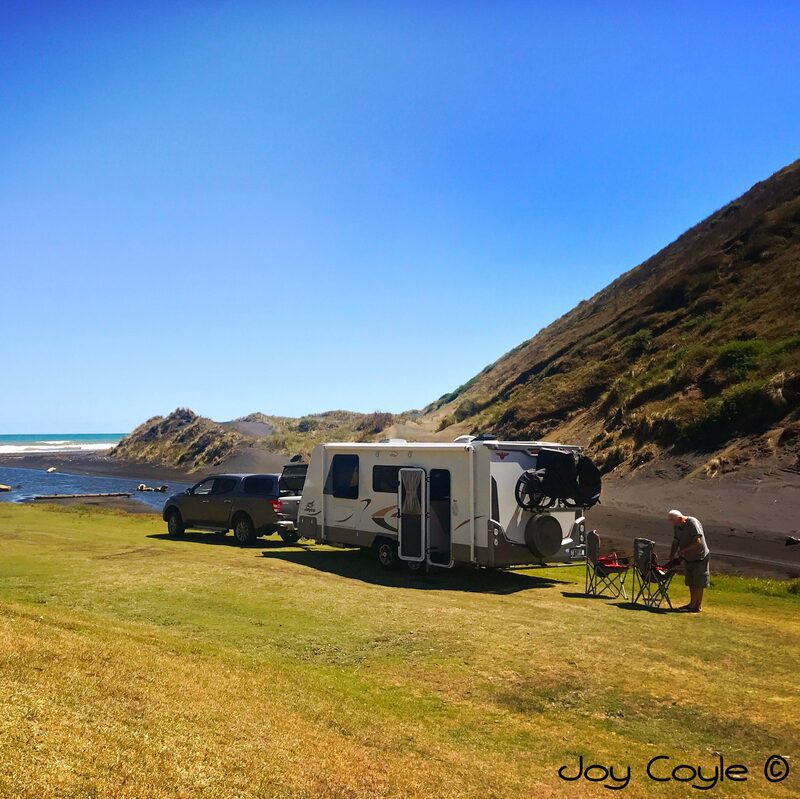 When in the Hawke’s Bay we love staying at Clifton Road Reserve (#3863 NZMCA). It’s right on the coast at Haumoana, is administered by the Hastings District Council, and there is an iron maiden for gold coin donations. The coastal cycle trail runs right past heading in the direction of the wonderful Clifton Cafe. It’s a popular spot and is meant for fully self contained and certified campers. Erosion is a big problem here, hence the attempts to slow it down you see in the above photographs. The weather was beautiful and we didn’t really want to leave, but we had a deadline to keep. I love the little old towns too and the railway stations. Interesting that my Mum as an 11 year old during the Christmas 6 week holidays was sent by train to Ormondville from Hastings to do the housework of an aunt (her Mum’s sister) and uncle who lived in Norsewood and did so for 3-4 years.